Whew, okay, that took forever. I have a lot to say about this one and I'm too lazy to reformulate so I'll just copy what I wrote on DeviantArt. 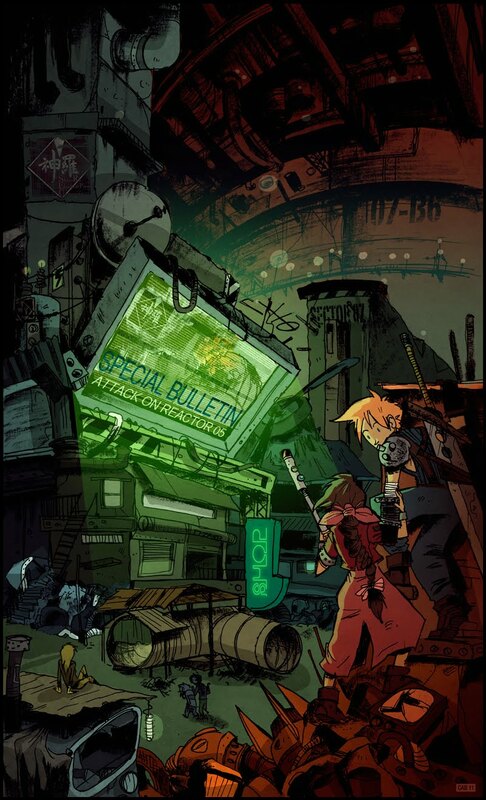 Every couple of years, I'm struck by Final Fantasy VII nostalgia fever. *boum started a (fourth, fifth?) game a two or three weeks ago and just watching the opening sequence made me itch to draw fanart. And then, a thought struck me. The only "character/thing" I've never been able to draw was Midgar. When I was a teen and playing this game for the first time, I was just astonished by the universe; it was my first exposure to RPGs, to cyberpunk, to anime, everything. I remember my brain overloading on backgrounds in Midgar and thinking there was no way I could EVER draw these scenes. But having now mastered the art of confusing cluttered landscapes, I just had to give it a go. The colouring is full of holes and mistakes but I guess it's part of my style now. Yup, I master the lazy style. I kinda have mixed feelings with the result though. I guess I could've done at least five different versions with different methods and colours but I had to stop at one point. I think the colours don't do the lineart justice but without colours, all the depth is gone. Plus, I really wanted to try give the scene an eerie radioactive Mako smog and just go crazy with the junk you find along the way in the Slums. This is kinda why I put little emphasis on the characters. I did doodle almost all of them though and I'll post it on my blog soon. Anyhoo, this is inspired from the scene when Cloud and Aeris go back to Sector 7 after AVALANCHE blows up reactor 5. I guess it'd be all over the news and I really liked the giant TV screen in one of the screens of the game. I can honestly say I'm no gamer, far less an RPG fan. But without this perticular game at this perticular time in my youth, I'd probably wouldn't even draw right now. So it deserved a worthy hommage.